What better way to get people to notice your presentation. People love to "spin to win" .... even the clicking noise helps drive them to your location. 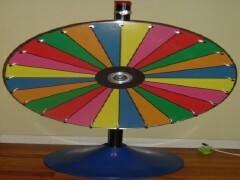 This table top Spinning Wheel is a must for your next Street Fair or convention.